The bf and I have been busy cleaning, clearing out junk, painting, sweeping, moving stuff into the house we will move to at the end of the month. We have been working there since the last weekend of February: the odd weekend and a few nights here and there. 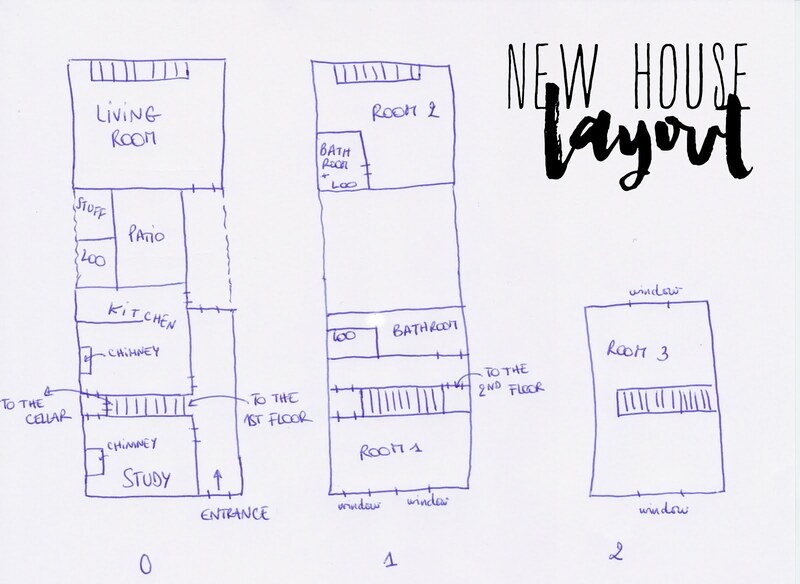 The house is actually TWO houses connected together by a hallway and separated in the middle by a little patio (an outside area). When we got there, there were still stuff and furniture in every single room. We know the owners so we helped them clear out the furniture they still hadn’t removed. 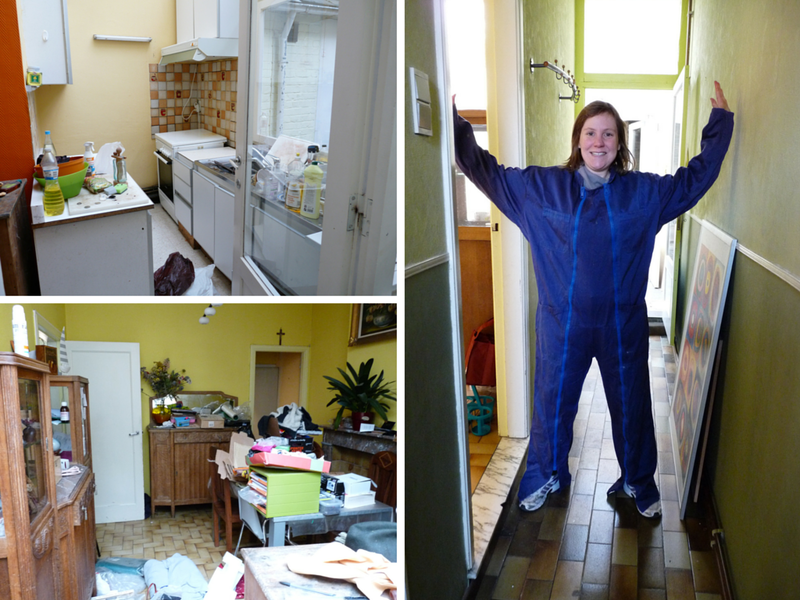 Pictured below, the kitchen and me in a very elegant and practical outfit! Yay! Unfortunately, it didn’t happen in one day. We only managed to clear out the “house in the back”. We figured since this “back house” had been renovated not too long ago, we would just clean it up nicely and move our stuff in. The room upstairs (Room 2) had a very torn out carpet, so we decided to get rid of it and install some laminate flooring. We wanted to keep the same paint colors to save some money, some time and our backs. 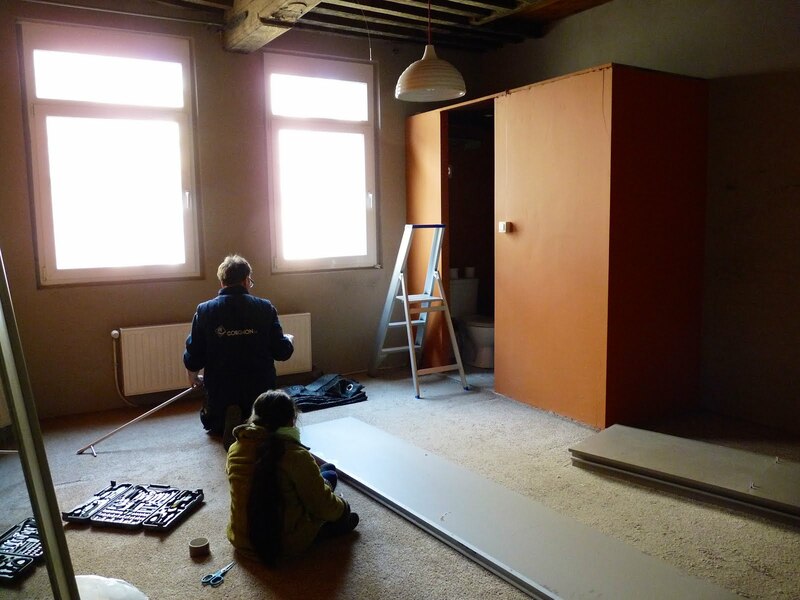 We had to disassemble a wardrobe first… It took forever! As the wardrobe was against a wall, we cleaned them all to get rid of the spiders web and accumulated dust. I found some leftover paint in the cellar so I painted over the dirty spots I couldn’t clean. It looked fresh! Before painting, we got rid of the carpet! 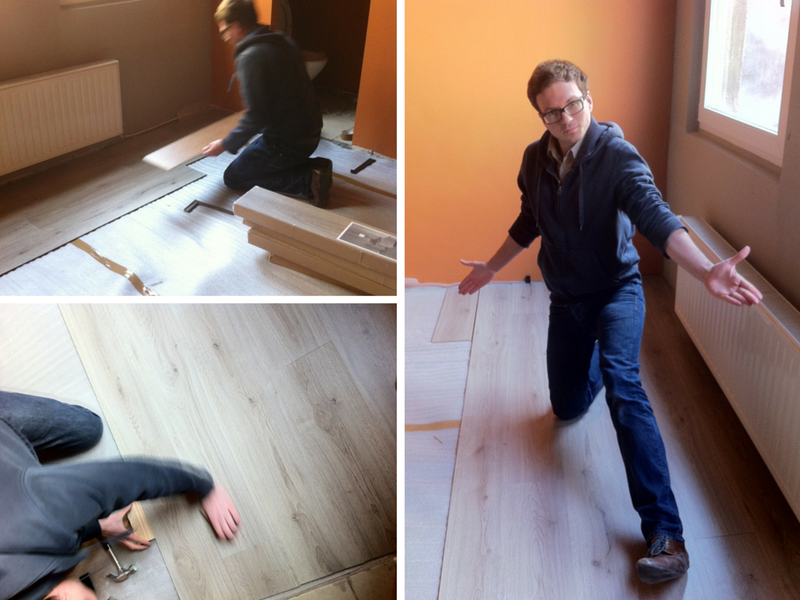 … and we went out to buy the flooring — it took us a few hours! The next day, I don’t exactly remember what we did, but I think we moved more of the owners’ stuff out (the cellar was full to the brim) and we prepped the floor of Room 2 to install the laminate flooring we had bought the day before (vacuuming, cleaning, installation of the underlay). About the floor… We bought the cheapest possible laminate flooring. It only cost us 3,90€ by the meter. Cheapest means poor quality and difficult assembly. We went back on the Tuesday evening to start working on the floor but we couldn’t manage to line three rows up correctly. Exhausted and tired, we decided to let it go and to come back the next Saturday. On the fourth day, on Saturday, we arrived at the house by train, relaxed and ready to move on with the installation of the floor in Room 2. Unfortunately we spent the whole morning cursing and yelling at each other because we couldn’t install neat rows. Every single time we added a plank, the rows placed beforehand would move! We tried on all sides of the room but we still had the same result! At last, we called a member of family who had already dealt with this type of flooring for his advice. He told us that, once upon a time, he had bought the cheapest flooring as well and couldn’t install it properly, so he ended up throwing everything in the bin and bought a more expensive solution. Ready to leave, and red with anger, we started to play with the hammer and push the planks into each other with great force. Luckily for us, it worked and we kept on going until we arrived at the staircase! Three weeks later, as I’m writing this, the room isn’t finished still!